All transactions are safe and secure with a reliable history in online purchasing behind each of our associates. 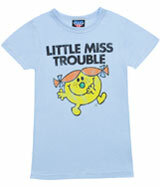 Buy the Little Miss Trouble t-shirt to own Little Miss clothing and merchandise. Although she may look similar to Sunshine, she is far from it. Meet Little Miss Trouble. In book six, she plays pranks on anyone who comes her way. Unfortunately, not everyone gets away unscathed. Poor Mr. Small ends up with two black eyes because of her mean and thoughtless pranks. Some of his friends get her back and she learns what it's like to be on the other side. If you think some people need a taste of their own medicine, then get this Little Miss Trouble t-shirt as a little reminder. In addition to the Little Miss Trouble tee above, browse the Little Miss Clothing Gallery for more apparel like men's and women's clothes, kids shirts or hoodies.